Learn everything you need to know about Gerolsteiner Mineral Water’s direct path from its source to the bottle. Valuable minerals, refreshing taste and purity: All carefully preserved so what Nature produces deep in the earth remains unaltered when bottled for you. Gerolsteiner arrives just as fresh and pristine to you as when it’s collected from the depths of the Volcanic Eifel. To guarantee this, each individual production step is monitored – from the source to filling the bottles – by qualified staff and with the help of the latest technology. Chemical analyses and microbiological investigations take place as part of product control. As natural mineral water, Gerolsteiner water is among the most strictly controlled foodstuffs, in accordance with the Mineral and Table Water Ordinance (MTVO) of Germany. Germany’s most popular natural mineral water comes from Gerolstein in the heart of the Volcanic Eifel, hence it’s name: Gerolsteiner. Mineral water is one of nature’s precious miracles. It is formed over many decades from rainwater, which is purified and filtered by slowly trickling through layers of bedrock, all the time absorbing valuable carbonic acid and minerals. Forklift trucks unload the empty pallets and crates from the trucks and place them onto a conveyor belt. Pallets and crates are separated. The pallets are cleaned and tested pneumatically for stability. Any defective pallets are automatically sent for repair. The crates are inspected for foreign bottles with the aid of light beams or a camera. Foreign bottles and crates that cannot be automatically unpacked are discharged and sorted manually. A machine lifts the bottles out of each crate and places them on a bottle conveyor. The empty crates are then cleaned. A specialized machine rotates the screw caps off the bottles. On the PET bottles, the labels are lifted off and any residue is scrubbed away using brushes. The caps and labels are recycled. Every single bottle is checked for foreign substances using an "electronic nose". Defective bottles are recycled. The washer for glass bottles cleans and disinfects up to 63,000 glass bottles per hour. The washer for PET bottles cleans and disinfects up to 42,000 PET bottles. Once all residues are eliminated, the bottles are cleaned in dip baths, then passed through several rinse cycles. Before the bottles leave the washer, they are finally rinsed out with fresh water. The total washing time takes approximately 15 to 20 minutes at a temperature of 80 °C for glass bottles and 54 °C for PET bottles. Several cameras inspect the cleaned bottles for particle contamination and physical damage and residual liquids. Contaminated bottles are returned to the washer; damaged bottles are sent for material recycling. Prior to filling with water, the bottles are first preloaded with CO2 in order to stabilise the pressure. Then each bottle is filled with the designated amount of water. The filled bottle is then transferred to the capper, where is it capped and sealed. Then the fill height is checked, and underfilled or incorrectly sealed bottles are discharged. The paper labels for the glass bottles are painted with glue and applied to the bottles by grippers. The cap is topped with a paper security seal, which is first opened by the consumer. On the PET bottles, the labels are tubular. They are processed at two stations; first a best-before date is applied on bottles by lasers. Secondly, the labelling machines stretch out the labels and pull them over the bottles. At the end of the process, inspections are conducted to check that the best-before date, the filling plant information and the filling time are all accurate, and whether the label is correctly applied. The bottles are distributed onto conveyor belt lanes and get deposited into the crates by grippers. The filled crates are then subjected to a thorough inspection. A "palletizer" grabs the bottle-filled crates from the conveyorbelts and packs them in layers onto pallets. All pallets are clearly labled. An encoded bar code on each label contains the product data so distribution from packing house to retail markets can be tracked. The packed pallets are strapped and stacked; ready for transport. Forklift trucks load the pallets onto the trucks for immedidate transport or for intermediate storage in our warehouses. Each step of the production process is closely monitored to ensure the water’s purity. The aim of Hazard Analysis Critical Control Points (HACCP) analysis is to ensure quality and safety throughout production, packaging and the sale of foods and beverages. Critical control points (CCP) identified by the analyses are monitored continuously and the tests are documented. Gerolsteiner has always claimed that the best products also deserve to be supported by the best technology. Whether it’s the development of innovative packaging, selection of materials, perfection of product safety or bottling technology – Gerolsteiner always aims to find the best solution, regardless of costs. Over the years, Gerolsteiner has been an industry pioneer, consistently creating new technology and innovative packaging. A prime example of this was the introduction of the PET reusable bottle for mineral water in 1998. Thanks to its low weight, energy-saving manufacture and high recyclability, it is both cost effective and environmentally friendly. Gerolsteiner invests in both glass and PET packaging. Since 2010, it has extended its portfolio to include a reusable 1 liter glass bottle in a convenient 6-pack crate, giving glass new impetus as a form of packaging. Today, Gerolsteiner is supplied in Germany and the Benelux countries in returnable glass and PET bottles and non-returnable PET bottles. Both non-returnable glass and PET bottles are offered internationally. This diverse range of packaging meets consumers' varied demands and contributes to Gerolsteiner’s position as a global leader in the sparkling mineral water sector. Gerolsteiner Mineral Water is obtained from depths of up to 250 m and it takes Mother Nature between 50 and 100 years to produce. Gerolsteiner operates twelve bottling facilities for glass and PET bottles (returnable and non-returnable) producing up to 38,000 1.0 l PET returnable bottles per hour and up to 57,000 0.7 l returnable glass bottles per hour. Over 400 daily checks and balances take place in Gerolsteiner’s internal laboratories, which is around 146,000 analyses annually. In addition, extensive external inspections take place regularly. Consumption of mineral and medicinal water in Germany is around 149 litres per capita per year. On average PET bottles are refilled between 8 and 10 times, glass bottles between 25 and 30 times. 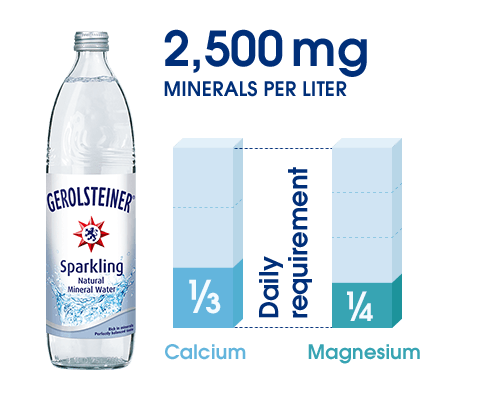 Gerolsteiner Sparkling contains 2,500 mg minerals per liter – that corresponds to 1/3 of the daily calcium requirement and ¼ of the daily magnesium requirement. 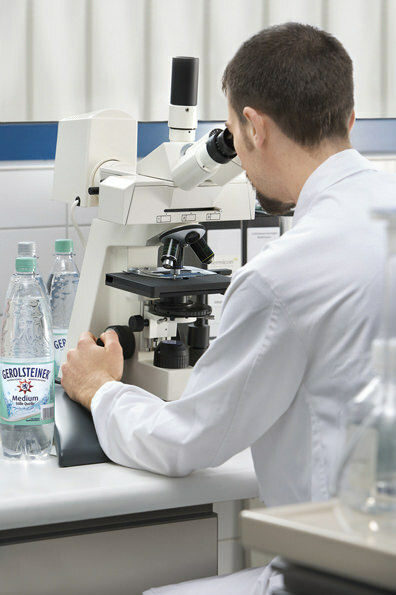 Gerolsteiner guarantees unrivalled quality by implementing numerous internal tests and third-party analyses throughout each stage of the bottling process.